File D/M-14, obtained from Professor Noël Dilly, London, England - Vessel name Bits, hailing port Medway, Kent, monohull, Twister sloop designed by Holman and Pye, LOA 28' x LWL 25' x Beam 8' x Draft 5' x 5 Tons - Full keel - Drogue: Jordan series, 90 x 5" diameter cones on 320' x 3/4" Multiplat nylon braid rode, with bridle arms of 20' each and 35 lbs. of chain spliced into the end of the array - Deployed in a storm in deep water about 25 miles west of Cape Carvoeiro, Portugal, with winds of 50 knots and seas of 15 ft. - Vessel's stern yawed 10° - Drift was about 50 miles during 50 hours of deployment. Noël Dilly has been sailing for 40 years and is Yachting Monthly's correspondent for Medway and North Kent, having written numerous articles, including Making And Using A Series Drogue (May 1994 issue of Yachting Monthly). A professor at St. George's Hospital Medical School (University of London), Dilly is one of the planet's experts on drag devices. An associate of the late Geoff Pack (Yachting Monthly), and also Peter Bruce (editor of Heavy Weather Sailing), the professor has been wrestling with the subject of heavy weather tactics for decades. Apart from making several series drogues, he has numerous other drag devices in his possession, including a 9-ft. BUORD sent by Victor Shane, a Para-Tech sea anchor and Delta Drogue, an Australian Seabrake, etc. Bits, a Twister, long keel, 28 ft. LOA, 8 ft. beam, Holman and Pye design. Weight when hanging from a crane, 5 tons. We built her over 3 years in the hospital car park, hence the students nicknamed me "Noah." Main influence on our fitting out was my experiences in a Contessa 32 in Fastnet '79. 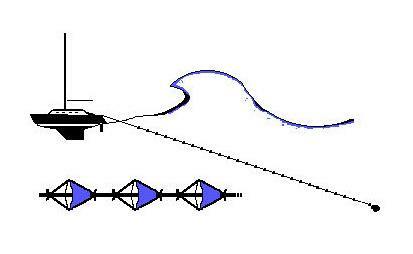 We use our series drogue whenever going to windward is a bore, that is, usually winds in excess of 30 kts. It is just not worth the bashing. Summer gales do not last above 30 kts much more than 15 hours and we do not seem to lose much more than 10-20 miles downwind of our starting position on the drogue. The longest we have hung to the drogue is 50 hours off Portugal, on a passage to Gibraltar from Portsmouth. It was January, wind NW Force 7-11 for 3 days, sustained Force 9 for 18 hours. Our wind gauge does not go above 50 kts, but BBC said we had a Force 11. Position, off the Berlenga Islands, near Cape Carvoeiro. We saw the Berlenga Islands from wave crests when we deployed the drogue, and could still see them 3 days later when we recovered it. I suppose we had moved about 10-15 miles, but I was not in the mood for measurement. However we were fit enough to ignore the temptation to sneak into Lisbon for R & R and carry on towards Gibraltar. Deployment: There are two ways of storing the drogue. We used to wind it onto a spool, weighted end first, with the bridle last. The idea was to attach the bridle, and feed out the drogue from the spool. But spools are awkward to store. Now what we do is store the drogue in a sports bag (zipper whole length of bag). We flake it in so that the bridle is at the top. This arrangement gives a great option of storage sites. We mark the two bridles with a piece of thick tape so that we know the correct lengths of the lines without having to adjust the deployed drogue, and, if necessary, we can deploy at night. Before we deploy the drogue, we remove the vane from the self steering and release the paddle. For deploying the drogue, we drop the trysail, but continue at about 15° from dead downwind under storm jib. Once the drogue is deployed we secure the tiller amidships with 1/4" bungee. Riding sail: Our storm jib is much smaller than the average storm jib and we rig it on a removable inner forestay (another invention I have fiddled with). This jib is 5ft x 4ft x 3½ft. The forestay extends from the cross tree [mast spreader] to the samson post. The jib flies about 4 feet off the deck. It is tiny, I would hate to think of the conditions in which I would be forced to take it down. I think it stabilizes the boat directly downwind. I picked up the idea when fleeing before the Fastnet winds. I like this idea of using a riding sail with the series drogue, but I would also treat Don Jordan's comments with great respect. I suppose that he is worried that the wind and waves may be coming from different directions [Jordan designed the series drogue for use without riding sails]. Once the drogue is deployed, we harden up both jib sheets so that the sail is amidships, and leave it. Motion of the yacht: I think the series drogue ride is a stable affair. Once deployed, description of the new motion of the boat as "bungee jumping" is a good one. Be prepared to hang on, or better still retire to your berth [Jordan recommends that everyone be strapped in by aircraft-types seat belts inside the boat]. In the troughs, she feels loose. As you rise up the wave and the wind hits with full force she hardens up. Surprisingly this is the best time to do things below deck. Usually that's all there is to it, but if you get accelerated by a crest, you can feel it and hang on for the quite dramatic deceleration. Once the crest has passed these things stop, and you are back to the up and down thing. It is all very slow and undramatic, until there is the violent motion associated with the odd crest strike. Cones surfacing: A very rare event. I have seen them revealed when a particularly steep wave was approaching. I suppose there were about 10 cones visible, but I was trying to fix a second safety harness clip at the time, and found that pretty urgent. In Force 7,8,9 I have never seen the cones surface. In wind strengths above that it is so difficult to look to windward, the spray hurts too much. Indeed our storm gear includes a pair of industrial safety goggles so that we can try to inspect the drogue/sea interface during the storm. Chafe: Chafe is the great enemy of all drag devices. To counter chafe at the weight end we enclose the chain-to-rope splice in a spiral whipping so it cannot move [Dilly uses a length of chain instead of the usual 35 lb. weight]. At the bridle end we enclose the lines in thick-walled polyethylene tube where they pass over the transom. Hatches & life raft: We have massively strong washboards. We seal the cockpit hatch joints with 2" duct tape, also the cockpit locker lids (we have discovered how leaky allegedly waterproof locker lids can be). Finally we move the life raft into its gale storage position, which is on the cockpit sole. It is secured in place by two straps that are jointed by a long pin, such that if you pull the pin the straps are released. This storage has two advantages. First it reduces the weight of water in the cockpit when you get pooped. And second, it is a much more secure place for the life raft than exposed on deck where a breaking storm sea might easily take it, just when it might be needed. Cockpit drain holes: Four 2-inch diameter cockpit drain holes are not adequate as it takes several minutes for the cockpit to drain. Next time I would try 4-inch diameter drains, but the hazard is then of sheets and lines being washed down them. Recovery: We have a bridle long enough to use the genoa winch to wind in the drogue. I takes ages, but we have plenty of time. My daughter Sarah has suggested that next time we take a line to the bow, outside everything, release the drogue, and lie bow to it, then use a combination of the anchor winch and motoring to recover it, just like recovering an anchor. In subsequent communications Victor Shane also asked Professor Dilly why he and other safety experts recommend that the angle subtended by the bridle arms be about 30° or less. Why 30°? There are good mechanical equations that show that as the angle between the two lines increases the load on them increases severely. 30° Is well within the safe angle. It is just about the same as the Hawaiian chappies idea of twice the transom width for the length of the bridle arms. Most experts agree that the bridle arms should subtend an angle of about 30°. 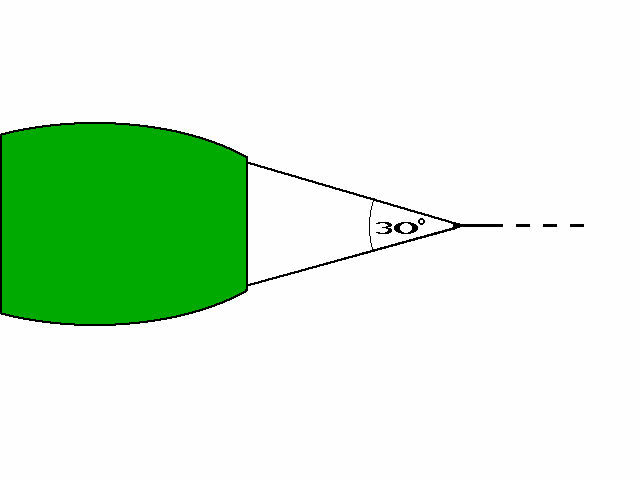 As the angle increases the toggle force can multiply severely.